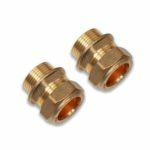 The C x MI Straight Coupler fits 3/8” tail and is compatible with stainless steel, plastic and low carbon steel pipes. It’s a compression fitting with one 15mm connection for the copper pipe, and a 3/8" male thread on the other end. This product is suitable for gas, compressed air and water application. Manufactured in high-quality brass, it is WRAS approved and compatible with both Hansgrohe and Grohe taps.